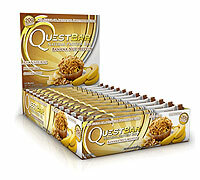 Quest Low Carb All Natural Protein Bars - Banana Nut Muffin Quest's All Natural Banana Nut Muffin Protein Bars are Gluten Free with No Junk ingredients and 20g of high quality protein. Try this amazing new flavor today! Remember Banana Nut Muffins - That home made treat, straight out of the oven, just like mom used to make? It may have been a while since you got to enjoy something this delicious. But never fear, because Quest Nutrition has released an amazing new flavor! They're as delicious and convenient as a candy bar, while maintaining all of the nutrition of a carefully prepared meal.